Embossed metal ceiling tiles and panels are made by stamping different designs onto blank tin panels, thereby creating an embossed look. 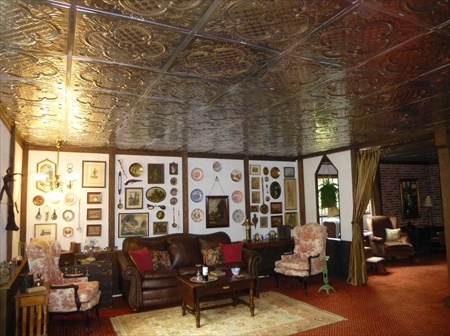 Embossed metal ceiling tiles are also known as stamped or pressed tiles. Our embossed metal ceiling tiles are based on designs that were popular in the 1900s and can dramatically change the look and feel of your house, building, restaurant or office! Embossed metal tiles and panels are available finished and unfinished in more than 30 distinct designs. We also offer these tiles in more than 80 different colors and hand finishes. Our high-tonnage presses create consistent and high-quality embossed designs to make sure that all tiles in your order will be the same. What’s more, all our 24in x 24 in embossed metal tiles are available in 3 installation options: nail-up, drop-in (for suspended ceilings) and deep drop-in (also for suspended ceilings). A smaller selection of our embossed metal ceiling tiles are available for the snap-grid ceiling system that makes installation of tin ceilings a snap (pun intended). In addition to 24in x 24in ceiling tiles, we also make 12in x 12in tiles for use in smaller areas, such as backsplashes in your kitchen, bathroom and other areas. 12in x 12in tiles are available unfinished and finished for nail-up installation in a smaller number of patterns and colors. Also available are matching embossed accessories that include metal ceiling molding and backsplash edging, switch plate covers and cone-head nailsso you can achieve a consistent look and feel for your project. Feel free to browse through our website, look at different patterns and colors that are available, and let us know if you have any questions or comments. We offer low-cost sample packs of our embossed metal ceiling tiles so you can get an idea of the high-quality and finish of our products. Don't forget to visit our Facebook page to see helpful tips, tricks and other articles.